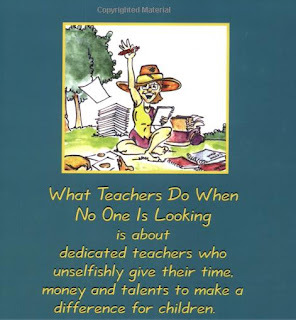 A GeekyMomma's Blog: What Do Teachers Do When No One is Looking? What Do Teachers Do When No One is Looking? I was checking out this infographic when suddenly something made me say, "Whoa!" As an educator, I was surprised, but then again, maybe I shouldn't be. See below the infographic to read more about what I'm referring to. 1. Are you on the move while at work? 2. No, I do most of my work from a desk. 3. Is your job to be creative, such as artist, musician, or writer? 5. What is it you do? 6. I work with people all day. 7. In what kind of setting? 9. What grade do you teach? Someone who is not on the move at work and does most of their work from a desk (hilarious), is not creative, and [but] works with people. For those of you who buy into that crap above, I highly recommend that you buy and read this book, What Teachers Do When No One Is Looking by Jim Grant. It will take you 5 minutes to read and it will warm your heart, and renew your faith in the teaching profession. When you are done reading it, you should then share it with every child you know so we can all start to give teachers back the respect they deserve. What are some other things teachers do that would surprise the public? Add yours in the comments. I imagine it would surprise most people that we spend so much of our summer "vacation" attending professional development; reading and writing blog posts, reading book after book that will hopefully help us become better teachers, organizing Google Hangouts to talk to other teachers about teaching, and testing out webtools and apps to determine whether or not we can use them with our students. If I got paid for every minute I spent thinking about my students and my job...I'd be able to afford more professional development! Fascinating how you ended your comment with how you would spend all that extra money. Thanks for your thoughtful comment. Thanks for sharing this. What surprises me (maybe it shouldn't) is that Sonos would release this while trying to attract customers/users, which shows just how sad the perception is if the message portrayed was in pure ignorance. I shall check out the book, and I thank you for sharing it. I invite anyone skeptical of what teachers do to peek in on any give educational Twitter chat, to view the receipts of our personal expenditures, to observe the nights spent working at home, the time spent for development and prep in the summer, and on and on. Both my wife and I got a chuckle out of this... Once we figured out where we were suppose to be in the classroom. I can honestly say that I burn through the soles of my shoes very quickly and it isn't because I'm sitting at my desk. Lee, I liked this post because it fires me up. From a perception point there is a lot of work to be done for our profession. It reminds me that aside from our peers, the parents of my students, my students, and my wife, that teachers are not valued very highly. I hated this post, because it reminded me of the same thing. I take opportunities to make sure people within my circle know that I just don't work 9-3 and August-Sept. I hope that at some point, perceptions will change. It's hard though, because the feeling that teachers are less than professionals is so entrenched. I almost always feel defensive and somewhat whiny when making my case. Even to friends. What would people find surprising? People might find it hard to believe I rarely sit down when kids are around. I spend about ten minutes in the morning on the playground where our grade lines up to try understand where each kid 'is at' that day. Getting a gauge on the room, if you will, so that I have an idea of their mood as they come in to learn. People might find it surprising that for a number of my kids, that the time they are in my class is the safest they feel all day. Many live in chaos. I give them a snack when they are hungry. I give them a voice, when they are often ignored. I give them encouragement when they need it. I’ve bought them shoes when they’ve outgrown the ONE pair that their parents could afford for the year. I listen to them. I don't spend time with my own son, because I volunteer coach for basketball, track volleyball, science fair, etc. We learn how to talk to each other and express ourselves without trying to tear the other person down. We are strangers on day one, but we cry together on the last day of school. I send birthday cards to former students. I handwrite a personal note to everyone in our 6th grade about the wonderful things I learned about them over our ten months together. I read, research, write, and contribute to a community of my fellow educators. They hold me up and inspire me to get better. Thanks for this post and fighting against this nonsense. So many people think teaching is a part time job. Was it ever? I can't imagine teaching in a one room school house when schools were first started...having to get there early to start the stove for heat, staying in for lunch to work with kids not up to standards, after school work at homes of kids who were not in school. When did it become easy? Oh, when I got a swivel chair so I can move quickly around from child to child while taking attendance at my desk? No, when computers entered the room, because they make everything so much easier that I no longer spend any time doing work outside of the classroom. Maybe it was when class sizes were cut down to 30 so I can have meaningful teaching time with each child, after giving them food since they never ate breakfast, and calming them down after they came in angry at their sibling, and handing out pencils, post its, erasers...to those children who lost theirs or never had supplies to begin with. Ah...I cannot wait to get into my class and listen to music that will earn me respect. The graphic doesn't say that teachers don't exercise creativity in their jobs. It only suggests that being creative is not the purpose of their jobs, which is correct. The "product" of a teacher is the impartation of knowledge, not the concrete result of being creative in the manner suggested in the flow chart (artist, musician, etc). I'm a bit more suspicious that most of these "suggestions" are more about conforming with stereotypes about the kinds of people who do the jobs than it is helping you to do the job better. Also, while the most important part of a teacher's job traditionally has them standing in front a class room, lets not pretend that a person can't be instructed from behind (or leaning against) a desk or across a table. Teachers don't give eight hour lectures. An average high school teacher has, what, maybe 5 hours of classes a day? A good deal of that time is inevitably going to include time for students to read, work, or collaborate when most teachers will observe from their desks while they do grading or other work. And those prep periods/office hours, grading at home, reading, researching, and professional development doesn't require teachers to be on their feet. If anyone got slighted in this respect, it's the department store workers who most definitely do not work behind a desk and are on their feet every bit as much as a barista. Despite not being a teacher currently, it is clear that the job of an educator goes un-noticed by most people. Regardless of the profession a person chooses, there will always be stereotypes of those professions that are untrue. Unfortunately, I am sure there are some teachers that do fit this label, which may be the reason for the perpetuation of such a stereotype. I believe that, with time, educators will get the respect they deserve. Hardworking teachers will make a difference in a child’s life and, hopefully, those will be the stereotypes that remain in those children’s minds. Thanks for sharing. I enjoy reading your posts.